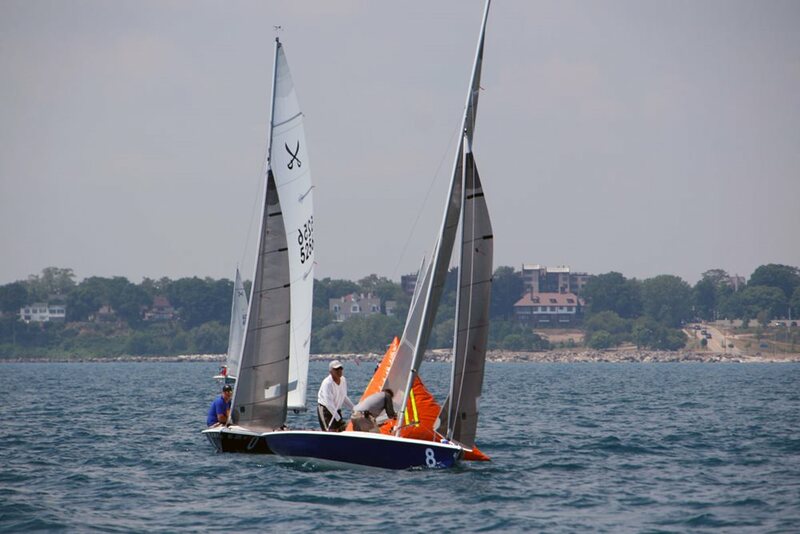 Marked by a noticeable increase in talent and skill level, the Buccaneer 18 class held their North American Championship August 8-12 at the Racine Yacht Club in Racine, Wisconsin. Quantum Sails had a profound impact on the 15-boat fleet, with three of the top-five finishers using fresh sets of Quantum® sails. Overall it was a good regatta, including all varieties of conditions: light air with flat water, light air with big chop, and heavy air with building waves. Though the Buccaneer features a relatively simple set-up, Quantum rep Randy Shore said there’s a lot to learn to keep the boats sailing fast. "For boats with so few strings to pull, there are still a lot of adjustments to make sure your boat is set up for the proper conditions, including lead position, headstay tension, vang tension, and, of course, jib and main sheet,” Shore explained. “Using only those controls, there’s a lot of gear changing you can do based on the conditions and tactical situation." John Weiss’s Quantum-powered Blind Squirrel made those changes well, taking second overall, including finishing in the top three for eight of the nine races. David Spira’s Altitude and Bob Spitz’s Blur came in at fourth and fifth, with each boat racing consistently throughout the weekend. One notable highlight from the regatta was a post-race debrief hosted by Shore. "All the competitors gathers around beer and a dry erase board to dissect and discuss the day’s racing," he said. "The crowd was thrilled at the format and the opportunity to gather some tips and confirmations from the top sailors." It was Shore’s first Buccaneer championship, and he said the class is headed in the right direction. "There’s an established base of Buccaneer sailors who’ve been doing it for a long time, but there’s also a younger generation that’s coming into that class and really working hard to get the boats going faster and ready for the regattas. They’re coming to the events to win," said Shore. "That shows good growth in the class. It’s got a bright future." Congratulations to everyone on an amazing event! For a complete list of results, click here!